The Kennetpans are the lands along the tidal estuary of the Forth river near the town of Stirling in Eastern Scotland. From Stirling, the Forth River meanders through Shallows until it reaches the North Sea. In the 12th century, local monks established a monastery where they panned for salt and also distilled what is called Uisce Beatha in Gaelic or the water of life in English. The Steins were local farmers in the nearby village of Clackmannan who may have had their origins across the North Sea in the Modern Day Netherlands before taking root in Scotland. John Jameson the founder of Jameson Irish Whiskey was actually born in Scotland in a small sea port called Alloa near the city of Stirling in 1740. He was the developer of the famous Bow Street Distillery in Dublin where Jameson Whiskey was born . Check out the full Jameson and Haig family tree below. John Stein was a grandson of Andrew Stein who was the patriarch of the famous Stein Whisky family. Andrew Stein had established a distillery in the Kennetpans in the early 1720’s and by 1733, it was the largest distillery in Scotland. The Steins were reputed to have learnt the art of distillation from their Monastery neighbours and after the reformation of the 16th century, they took over the monastery lands along with the practice of distillation. By the early 1730’s the Steins were the leading Scottish industrialists of their time and the distillery in Kennetpans was the largest in the world. At the same time, their neighbours from nearby Kilbagie the Haig Family were also developing a similar but smaller distillery empire. Robert Haig had been one of the earliest commercial distillers in Scotland in the early 1600’s. It was inevitable that these two locally powerful whisky families would socialise and intermarry in a small area of just 20 square miles and this came to pass when a great great grandson of Robert, John Haig married Margaret Stein in 1751. They went on to have 10 Children and it was this first Stein-Haig generation that formed the foundation of the Haig and Jameson whisk(e)y empires in Scotland and Ireland. John Haig’s eldest daughter, also Margaret Haig, married John Jameson in 1768. Jameson hailed from the nearby village of Alloa and as the Sheriff of neighbouring Clackmannan village, moved in the same local social circles as the wealthy Steins and Haigs. In 1788, twenty years after their marriage, he and Margaret moved to Dublin where John Jameson worked with Margaret’s Stein cousins in further developing a huge new Dublin Distillery in Bow Street which had originally been opened ny Margaret’s whisky distilling cousins the Steins in 1780. Many years later, in 1805, the Jameson Family took over the Stein’s share of Bow Street distillery and this was the start of the Jameson Irish Whiskey company. 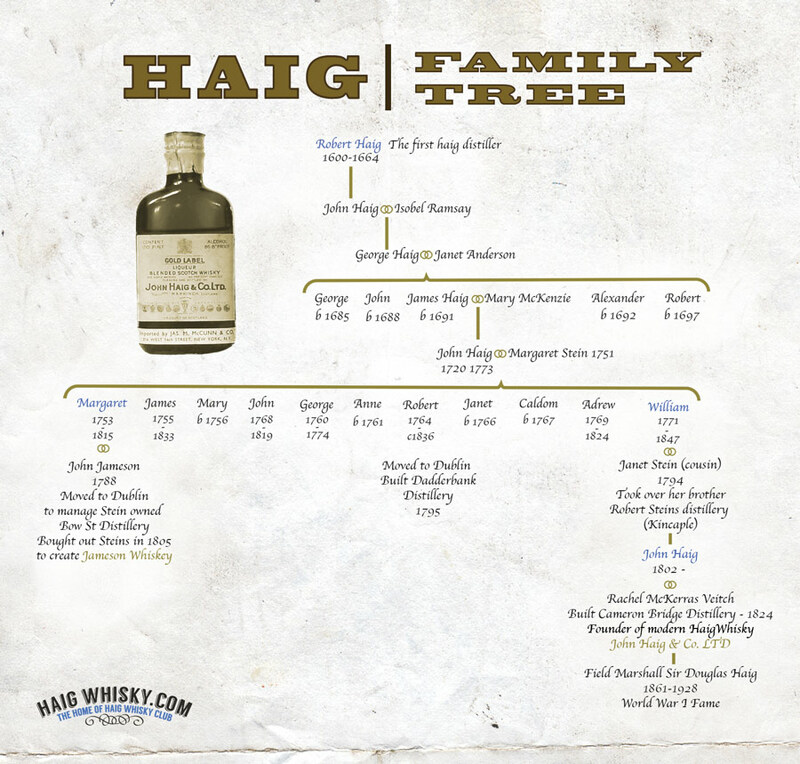 You can view the full Haig family tree below showing the links between the Haigs, Steins and Jamesons. In 1788 John Jameson moved to Dublin with his wife Margaret to manage the Bow Street Distillery opened by the Steins in 1780. A change in the British Excise regulations took place in 1788. The Lowland Licence Act required Scottish Lowlands Distilleries who wanted to sell spirits in England, to give 12 months notice before they could enter the market. Many Scottish Lowlands distilleries went bankrupt and were forced to close. An earlier 1784 Wash Act, designed to stimulate and encourage regulated whisky and gin production in the Scottish Lowlands had been too successful and was flooding the market in England with cheap spirits. A subsequent Scotch Distillery Act in 1786 was then brought in at the request of the fearful London Gin industry to slow down the new and exponentially growing Lowlands spirit production through heavy taxation on stills and production. The 1786 Scotch Distillery Act and 1788 Lowlands Licence Act which were vigorously opposed by the Likes of Robert Burns, placed such a burden on newly expanded lowlands distilleries such as the ones owned by the Haigs and Steins, that they quickly moved investment and production to Ireland and Dublin in particular, where these punitive Scottish tax penalties and embargos did not apply. One of the beneficiaries of this redirected investment was the Steins Bow Street distillery in Dublin. In the ensuing twenty years, a number of distilling premises in and around Smithfield and Bow Street were combined by the Steins to become the famous Bow Street Distillery. As mentioned already, the Steins and Haigs were closely related through both family and business, so it was no surprise that the Steins would offer the appointment of distillery manager to John Jameson, husband of the Haig’s eldest daughter Margaret. John Jameson managed the Bow Street Distillery for the Steins from 1788 to 1805. In 1805, the Jameson family acquired the Bow Street Distillery from the Steins. John Jameson’s son, also John, took over the running of the business. Thus were laid the foundations in 1805 for the iconic firm of John Jameson and Son. Margaret’s younger brother Robert also moved to Dublin where he established the Dodderbank distillery in 1795. But it was Margaret’s youngest brother William Haig who founded the latter day Haig Whisky labels that we recognise today. Robert had married his cousin Janet Stein and ended up buying out her brother Robert Stein when he ran into financial difficulties with Kincaple Distillery. It was Janet and Roberts’s son John Haig born in 1802 who then built the Cameronbridge Distillery in 1824 where all modern Haig Whisky such as Haig Gold, Haig Dimple, Haig Pinch and Haig Club is still made to this day. Lest there be any illusions of happy families, it should be noted that the Steins and Haigs while intermarried, were quite ruthless in business and often targeted and took advantage of the other families financial difficulties to grab each other’s businesses over a period of 100 years. The Steins were particularly ruthless and often sailed close to the wind with the customs and excise and revenue and taxation. They were also superb technical innovators who pioneered efficiency in whisky distillation. In 1828, Robert Stein refined an early column still design first developed in 1822 by Cork man Sir Antony Perrier and called it the Stein Patent Still. He introduced it to the Stein Grain Whisky Distillery in Cameronbridge but was unable to generate enough interest or investment in Europe and America to commercialise his design. Stein’s work was subsequently developed by Irish man Aneas Coffey by who was granted a patent for his continuous still design in 1830. Continuous column still distillation in “Coffey Stills” is still used today in the production of single grain whisky such as Haig Club. In total, the number of distilleries built in Scotland and Ireland was ten by Steins, seven by Haigs and 2 by Jamesons. As the Haig family whisky empire grew stronger, the Steins let go of their whisky assets to focus on shipping and engineering interests which they had developed initially to support their distilleries international exports by the vast rail, canal and shipping infrastructures that they had developed themselves throughout Scotland and built up considerable expertise and business interests in. Meanwhile, over in Dublin, John Jameson who you will remember had not been born into the whiskey world, brought innovation of a different kind to the distilling industry. John’s innovation was in quality. Quality in raw materials, production standards and in people management. John Jameson was known to pay more for better grain, to age his whiskey longer than his competitors and to invest in the welfare of his employees. Many thought that in these industrial revolutionary days of cheap labour and huge profits, that he would ruin himself by spending more and risking quick profits to achieve and ensure lasting quality. But he prevailed and the quality for which Jameson Irish Whiskey became known survives to this day, over 200 years later alongside their Scottish Haig Cousins. Bow Street and Marrowbone Lane. Four of John Jameson’s sons followed their father into distilling in Ireland. With John Jameson II installed at Bow St., his younger brother William was distilling across the river Liffey at Marrowbone Lane. After William’s early death in 1802, a third son, James, took over William’s interest in the distillery although the firm still carried William’s name. As you fly into Dublin Airport today via Dublin Bay and Howth, you may pass a large and quite visible country estate and golf course which is the Portmarnock Hotel. The hotel building was originally the Jameson family home, St. Marnock’s. I understand that the hotel have only recently become aware of their role in Irish whiskey history, so hopefully they will see fit to create a suitably fitting Irish Whiskey Bar to honour their previous owners. King Edward VII often visited the Jamesons at their beachside home and on his last official visit to Ireland in 1907, he unveiled a plaque which was designed especially to mark the occasion of the marriage between members of two great distilling families, Jameson and Haig. The plaque can still be seen in the grounds of the hotel in what was then labelled ‘The Secret South Garden’. Bow Street and Marrowbone Lane distilleries worked independently and were in fact business rivals. A fourth son, Andrew who had a small distillery at Enniscorthy, Co. Wexford, was the grandfather of Guglielmo Marconi, the inventor of wireless telegraphy and was also an ancestor of one time Irish politician Ivan Yates. As Diageo are seen to offload some of their whiskey interests such as Bushmills, wouldn’t it be great if Jameson were to one day buy their Scottish cousin Haig and bring the journey back to full circle! Would you know anything more about the history of the distillery at Kennetpans – and when it closed. My ancestor John Boyd (with 3 cousins) was sent by the Steins to Clonmel, Tipperary, to establish and manage the Millfield Distillery in/around the turn of the 18/19th C.
I, too, would be interested in a firm date for the closure of the Kennet Pans Distillery: I have seen the dates 1820 and 1825, but without firm documentation. I have been researching the Steins in connection with the Marlfield Distillery—I am also descended from one of the men (James McQueen) who were sent by the Steins to set it up. Letters from him and the Boyds have come down in the family. A Dudley: if you have an interest in sharing family history information, please reply to this page, and we can figure out how to proceed. William Jameson, son of John Jameson (1740-1823) died in 1822 not 1802. I had an enjoyable visit the Jameson museum in Dublin a few years back which prompted me to research this grave. Your historian might be interested as the marriage of the Haig and Jameson familys created the whiskey. I am born and bred of Alloa and know quite a bit off the history of my home town and even though I am irked at you saying that Kenettpans was just down from Stirling, it is closer to Alloa which was more than a village due to it’s glass, pottery, yarn, wool, brick and brewing industries. You also called it a sea port which I quite good when you consider that Alloa is at least 50 miles from the Firth OF Forth. There was a very large shipbuilding industry as well!! Not to mention the coal mines that where throughout the county. As a by note John Jameson senior lays at rest in Greenside Cemetery in Alloa. Dear Mr. Taylor, While I would of course like to thank you and welcome your contribution to my Haig Whisky site, I am at somewhat at a loss to understand both the tone and content of your posting. The reason I referenced Stirling is that my blog is not aimed primarily at a local Alloa audience, but rather at a global audience who would like to know more about your home area and might even like to visit as welcome tourists. That’s why I reference a larger town which is easier for them to locate on first look at a map. If I were talking about the Jameson family Home in Ireland, I would first reference to Dublin rather than Portmarnock some 15 Kms from Dublin to give my readers a simple initial orientation. The last time that I sailed into Alloa from Edinburgh via the Firth of Forth, it was a tidal harbour. A quick look at the attached map which I have attached to a following post shows the reader that Alloa is a coastal port on the north shore of the Firth of Forth about 5 miles from Stirling and about 3 miles from the Kennetpans. On the Firth of Forth rather than 50 miles from it. Very interesting. Never realised the Whisky/Whiskey world was so small.